The first time I heard about a small-business owner in New York City facing a huge rent hike, I was incredulous. Then I heard about storeowners and restaurateurs that got their rent doubled. Finally, I realized what I was witnessing: the norm. That’s because there is little to protect small-business owners from the greed of landlords. As for landlords willing to hand a small-business owner a de facto commercial death certificate, it’s a wonder they can sleep at night. Bit by bit, those who impose unreasonable rent hikes are contributing to the decline of the very stability of our city’s most iconic treasures. Take Manhattan’s Little Italy, for example. “If my landlord raises my rent to double what I pay now, how can I pay that by selling coffee and pastries?” asked Nick Angileri, who owns La Bella Ferrara on Little Italy’s Mulberry Street. Though he’s been in business there for an astounding 45 years, just in the past five Angileri has witnessed the impact of hefty rent hikes first hand. On historic Mulberry Street, where his shop sells homemade cannoli and an array of other Italian delicacies, the storefront signs around him are gradually becoming Chinese. What was once a continuous flow of Italian restaurants, cafes, and shops is now heavily interspersed with tiny stores hawking everything from plastic cellphone covers to cheap perfume. Some traditions remain, though they are precious few. The annual Feast of San Gennaro is still held every year, turning the stretch of road between Canal and Kenmare streets into a unique slice of New York City life. Though it’s a boon to business, it’s not enough to sustain the rest of the year, and many Italian businesses have gone. 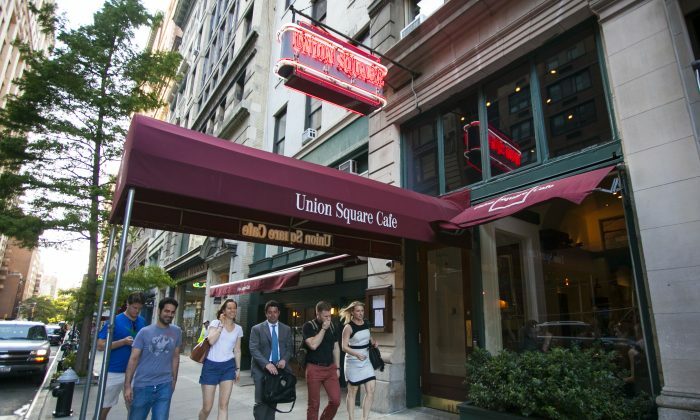 Union Square Cafe will close at the end of 2015 when the lease expires, and will reopen in a new location (to be determined), but I can’t help but wonder what will wind up in its place. A big box store, maybe? There’s little doubt that it has helped changed the face of its current neighborhood in the past 20 years, though. “remember when this ‘hood was still sketchy … and now it’s too rich,” wrote one commenter on Twitter about the ‘afé’s closure. Other recent casualties of rent hikes are easy to find. According to New York Magazine’s food blog Grub Street, last month the Lower East Side’s well-known Sorella closed, and earlier in June, Wylie Dufresne, the owner of the trendsetting wd~50, announced that his place will close in November. So how, in a town where seemingly everything is regulated and controlled, can landlords have the freedom to double the rent and force out longtime business owners? Small businesses are the lifeblood of communities, on a micro and macro scale. They create jobs, foot traffic, continuity, and stability. They generate taxes for the government and memories for patrons. It seems in the best interest of the city to help them stay in place, not be run out on a rail.